In 1989, not long after the first description of the preconditioning phenomenon by Murry et al. , demonstrating a protective effect against myocardial ischaemic damage (infarct size limitation), we explored the possibility that preconditioning could also protect the heart against those severe ventricular arrhythmias which arise soon after the onset of myocardial ischaemia. We were particularly interested to assess the extent to which the coronary endothelium determines arrhythmia severity following coronary artery occlusion and whether this plays a role in ischaemic preconditioning. 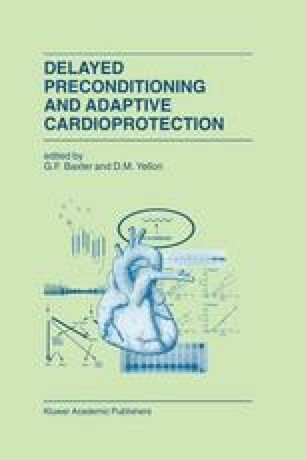 In this chapter, we describe the protection against ventricular arrhythmias afforded by preconditioning, with particular emphasis on the delayed form of protection.